The Patterson Rotary Blues & BBQ Festival has a reputation for attracting great artists and has become an annual must-see for music fans. This weekend’s two-day line-up will not disappoint! Bands include recent New York Blues Hall of Fame Inductee, Willa Vincitore (Willa & Company). The eclectic Petey Hop will perform in his own masterful, distinct style. Also, singer/songwriter/guitarist Pat O’Shea (former Levon Helm guitarist) will treat the audience to some pure American music influenced by heartland country, down-home blues, and straight ahead Rock n Roll. Fan favorite, Dylan Doyle, will also be back this year. Dylan has been a loyal supporter of the Patterson Rotary Blues and BBQ Festival for many years. 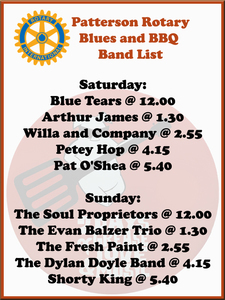 As always, the Patterson Rotary Blues & BBQ Festival has tasty BBQ, cold beverages (including beer and wine), and lots of things to do for the kids (operated by Fun Zone). Bring your blanket or chairs. Entrance is free. Please no outside food or drink. Proceeds and donations go to helping local community charities and non-profits.